Beautiful lawn and gardens improve our quality of life. Gardening is one of the top five hobbies in America. 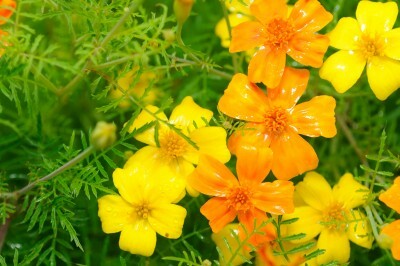 We enjoy beautiful flowers, majestic trees, lush green lawns, and the variety of texture, color and scents from plants. Trees clean the air; grasses protect our soils, we all eat because of plants. We are committed to beautiful, healthy landscapes and water use effiency. When lawns and gardens look beautiful, you know people care. Commitment to beautiful landscapes quietly speaks of commitment to community, guest and family, and it feels good! People appreciate a water conservation ethic. A commitment to efficient water use and healthy plants can be achieved with proper water management. Plants are healthier when they get the right amount of water, when they need it. Water sustains beautiful landscapes, but often plants get too much water. Sometimes we overlook that plant roots need both water and air. The best way to water is deep and less frequently. The soil should begin to dry out, drawing air into the soil, before watering again. Efficient water use is not easy; if it was people would be saving more water. To water efficiently takes a lot of time and effort. Weather Reach Smart Irrigation Control does the work for you by monitoring climate conditions to know when to water. Climate controlled irrigation has been used for decades on farms, golf courses, parks and schools. Weather Reach Smart Irrigation Control provides a cost effective solution so you can enjoy the efficient water use and sustain beautiful healthy landscapes.